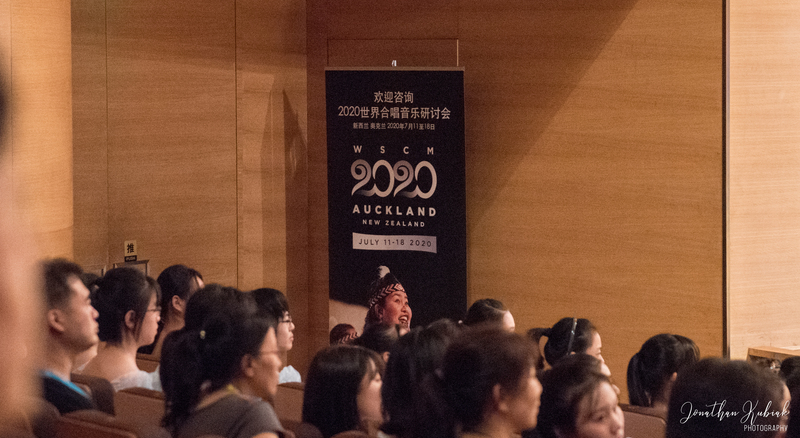 WSCM2020 promoted in Beijing and Europe - New Zealand Choral Federation Inc. In late July and early August WSCM2020 Artistic Director John Rosser and interim Project Manager Juliet Dreaver travelled to Beijing with John’s choir Viva Voce to promote New Zealand’s World Symposium on Choral Music in July 2020. After concert appearances complete with Chinese-text banners and handouts, and an intense but productive meeting with IFCM President Emily Kuo-Vong and a key figure in the Chinese arts and entertainment world, John and Juliet headed to Estonia to establish WSCM2020 headquarters at Europa Cantat in Tallinn. This was a wonderful opportunity for in-depth conversations with potential registrants, with choir leaders who were preparing applications for selection, and with composers and publishers who will travel to Auckland for the Symposium’s music expo. Estonia, country of the ‘Singing Revolution’ was an exhilarating venue for such an iconic festival, attracting many fine choirs who braved temperatures in the 30s to perform. After the business of the days was complete, highlights were the ‘Night of Choirs’ with groups singing throughout the Old Town, and the ‘Happy Birthday Estonia’ concert at the Song Festival grounds, where 7000 voices sang in multiple languages to celebrate 100 years of Estonian independence. It was a wonderful way to be reminded of the power of singing together, while at the same time making strong connections and collecting pre-registrations for WSCM2020! We agreed to a photograph with Bob Chilcott if he’d agree to consider Auckland in 2020!